I suppose that in order to properly appreciate a movie like THE CORE one would have to have been brought up on movies like 1966’s “Fantastic Voyage” in which a team of scientists/surgeons and their submarine are miniaturized and inserted into a human body in order to perform brain surgery from the inside. Or 1965’s “Crack In The World” where a project to tap into Earth’s geothermal energy goes wrong and a massive crack threatens to split The Earth in two as a team of scientists chase it around the world, trying to halt it. Or 1961’s “Voyage To The Bottom Of The Sea” where a nuclear submarine has to race time to fire a missile in the right place at the right time to save the world from being fried by The Van Allen radiation belt which is slowly cooking the earth. THE CORE is a movie that makes science geeks fall out laughing because there’s not a single so called ‘scientific’ fact in it that makes a lick of sense. But while I was watching it I didn’t care one bit. Because THE CORE took me back to a time when I was kid and science fiction movies meant I was going to watch an extraordinary adventure that took me away from my Bed-Stuy neighborhood for a couple of hours and took me to a world where scientists ruled and had outrageous adventures on an everyday basis. They were not only the smartest guys in the room they were the bravest and the ballsiest. They went to the stars. To other dimensions. To the past and the future. They saved the world. They saved their friends and family. And I dearly wished I could be one of them. Strange things are happening. Thirty people in Boston all drop dead at the same time in a 10-block radius. Pigeons in London’s Trafalgar Square lose their sense of navigation and go berserk, smashing into buildings and terrorizing people as they fly about in a frenzy. The space shuttle Endeavor has to crash land in the middle of Los Angeles because somehow their navigational beacon put them down in the wrong place. 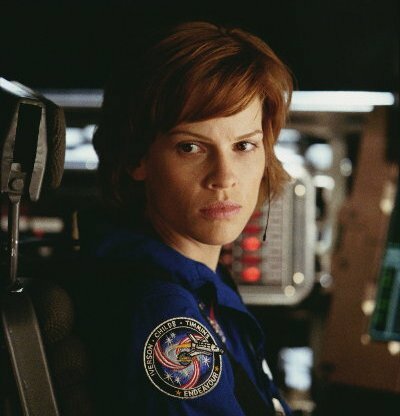 It’s only due to the exceptional navigational skills of Major Rebecca Childs (Hilary Swank) that the crew survives and the shuttle comes down in a relatively safe place. 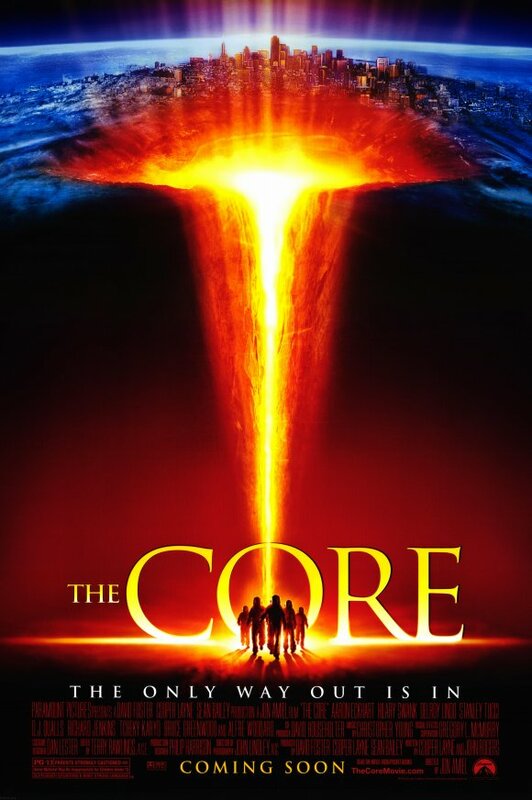 Dr. Josh Keyes (Aaron Eckhart) has an idea what is wrong and his research is confirmed by Dr. Conrad Zimsky (Stanley Tucci) and they both present it to General Purcell (Richard Jenkins): The molten core of The Earth has stopped rotating. As a result the electromagnetic field of the planet is destabilizing and without it, Earth will be a dead planet within a year. There’s maybe only one chance: detonate a series of nuclear bombs in the core to ‘jump start’ the molten core and set it to rotating again. But how can they journey to the center of the earth itself in time? The answer lies with Dr. Ed ‘Brazz’ Brazzelton (Delroy Lindo) who had his research stolen by Zimsky 20 years ago. Since then he has been living out in the desert, working on his life’s dream: a ship capable of traveling through the earth utilizing a sonic laser. 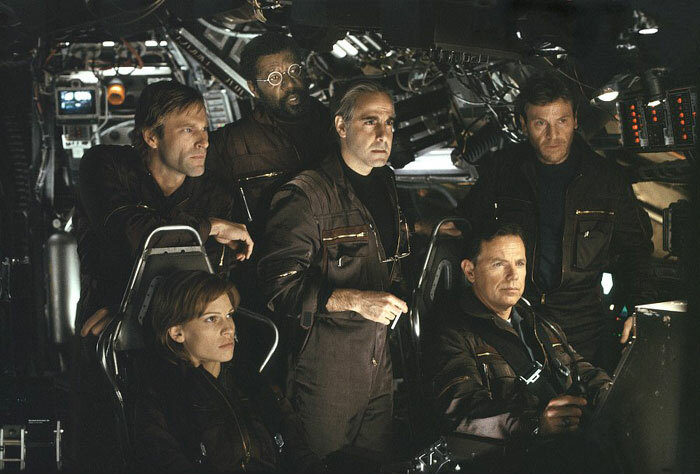 Brazz is given a blank check by General Purcell to build his ship and a team is assembled: Dr. Keyes, Dr. Zimsky, Dr. Brazzelton along with nuclear weapons specialist Dr. Serge Leveque (Tcheky Karyo) and to pilot the craft: Major Childs and Commander Robert Iverson (Bruce Greenwood). On the surface their support team will be General Purcell, Flight Commander Talma ‘Stick’ Stickney (Alfre Woodard) and the real wild card in the deck…a computer hacker called The Rat (DJ Qualls) who crippled the FBI’s database a year previously but has taken this job to stay out of jail. Rat’s job is to ‘hack the planet’ and monitor/obfuscate/control the flow of information on The Internet so that the rest of the world doesn’t find out it’s only got a year to live or about the mission to restart the world. The ship is built and the crew embarks on their mission inside The Earth itself to reach and restart the molten core before the world is devastated. There is absolutely no point in trying to pretend the science of THE CORE is anything like the science we know. Hell, ‘Star Trek’ technobabble makes more sense. But y’know what? It’s so much fun watching actors like Aaron Eckhart, Tcheky Karyo, Stanley Tucci and Delroy Lindo act as if it does I didn’t care. Take for instance when Dr. Brazzelton demonstrates the miracle metal his ship is made of: it gets stronger the more pressure is applied to it and actually draws power from heat. He’s asked what it’s called and Delroy Lindo replies with a straight face: “I call it Unobtanium” How could you not love a movie that has a miracle metal called Unobtanium? I really can’t see how anybody wouldn’t love THE CORE unless you’re really a science geek who can’t stand anybody monkeying with your beloved rules of physics. I remember reading an article way back when I was a kid where Isaac Asimov wrote the novelization for “Fantastic Voyage” even though he believed that miniaturization was impossible. His reason? : “Hey, it’s a good story.” And that’s what THE CORE is. It’s impossible but it’s a good story. The performances by all concerned are quite good. Especially Hilary Swank who looks like what I figure a real life female Air Force officer would look and behave like rather than a big-breasted bimbo playing dress-up. Delroy Lindo is also quite good as the eccentric inventor of the miracle ship that travels inside the earth. As improbable as the thing may sound, the way Mr. Lindo explains how it works you may be tempted to climb into the thing yourself just for the ride. I also liked Aaron Eckhart as Resident Brilliant Guy who can come up with any solution for any problem. Fans of Alfre Woodard are going to be disappointed as she really doesn’t have a lot to do except stay on the surface and look worried. DJ Qualls has a really nice bit where he uses a comb, the tinfoil wrapper from a stick of chewing gum and gives Eckhart’s character unlimited long distance on his cell phone. And I really liked how the scientists didn’t all immediately jump to be heroes and risk their lives. They’re all men of action but men of thought as well. THE CORE doesn’t have a typical bad guy. It’s more of a race against time where the characters have to fight against the very elements. I suppose it could be compared to ‘Armageddon’ in a way but it’s a lot better than that Michael Bay noise-fest. The characters in THE CORE are much more likeable and when they die we feel it. It’s edge of your seat stuff that’s nothing but mad fun. Highly recommended for a Saturday afternoon. I love this film because its science is so bad. I love the 80s end-of-the-earth buddy films. Every death in this film is sympathetic and pulls at heart-string even Speilberg would admire. Thanks for a great essay. Love The Core. I’d never turn it off, but the death of Brazz and Zimsky really got to me, each going out in a way that not only reinforced their flaws but also pointed a spotlight at their better points…just a fantastically cast movie. Good stuff.